Create your own fascinating and realistic underwater world on your mobile device! AquaLife 3D - it's a real live aquarium that you can take with you wherever you go! With AquaLife 3D you can create attractive saltwater, freshwater and even fantasy aquariums as well as choose their inhabitants and decorate them. You can buy, feed, grow and sell fish, earning coins, diamonds and experience. 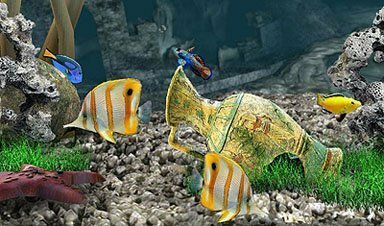 There are over 100 species of exotic fish, more than 100 decorations and items, a variety of backgrounds and aquatic pets. Your possibilities are endless! Enjoy the journey into the alluring and mysterious underwater world and be sure to invite your friends! AquaLife 3D is your real aquarium in your mobile device! - play with your friends, give and receive gifts.